The last time we spoke to documentary animation filmmaker, Ng'endo Mukii, This Migrant Business documentary film was still on circuit at a festival therefore we could not watch it at the time. 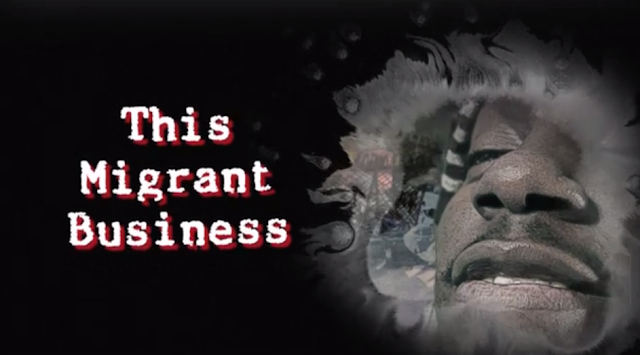 Now that it is open for watching, we get to see the creative animator's yet again incredible not to mention fresh depiction of the subject on African migrants to Europe and the Middle East. The project was commissioned by the Danish Refugee Council embassy and the Regional Mixed Migration Secretariat (RMMS), an NGO whose overall objective is to support agencies, institutions and forums in the Horn of Africa and Yemen sub-region to improve the management of protection and assistance response to people in mixed migration flows within and beyond the Horn of Africa and across the Gulf of Aden or Red Sea in Yemen. In an interview with Smart Monkey TV, Mukii says the short film looks at systems that exist and perpetuate the movement of refugees and migrants trying to get to Europe the Middle East for better ways of life; the overall focus is African migrants moving through these systems. She elaborates that people are always complaining why are these people moving here, why can't they solve their issues in their countries than moving here, yet it's not just mere migration as there's someone benefiting from the business. There's someone who makes sure that the system continues; someone making money out of it. The Kenyan filmmaker has become renowned for exploring crucial issues through animation.